Red Carpet Booth show with Premium Backdrop and Stanton Add-Ons. The Red Carpet Photo Booth is simply a photo booth without the booth. 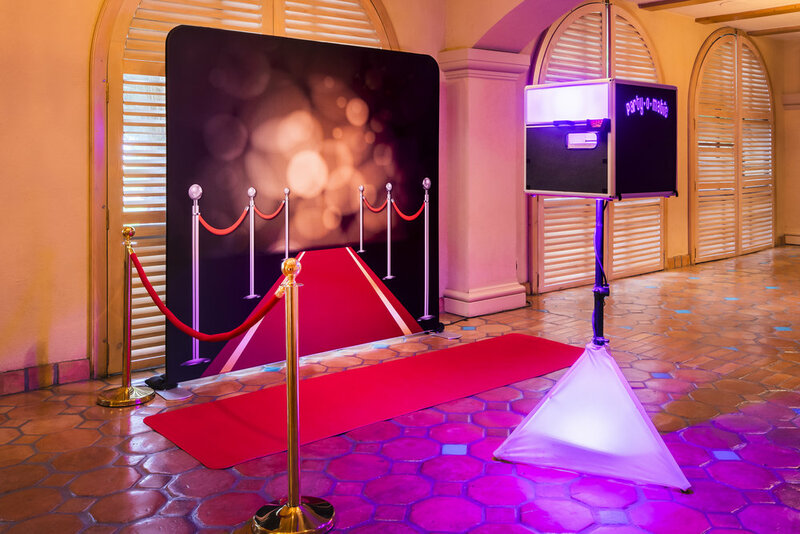 It has all the same photographic qualities and capabilities of an enclosed photo booth, but instead of entering into a booth and closing a curtain, guests simply walk up to the magical box. Because there is no privacy of a enclosed booth, guests' antics are exposed to all. The Red Carpet booth can be set up as a Stand Up or Sit Down. Why have an Red Carpet Photo Booth instead of an Enclosed Photo Booth? Red Carpet Photo Booths can be ideal for certain situations, for example a Red Carpet event where guests are moving from one area to another or events like conventions and trade shows where intimacy is less important. Also because of the quicker setup time, we can offer the Red Carpet Booth for less than an Enclosed Booth and you get the same great quality photos! Options for seating and backdrops for use with the Red Carpet Photo Booth are limitless. This set-up is perfect for your red carpet Oscar party. Click here to view Classic Curtain Backdrop colors. Our Classic Curtain colors are Red, Black, & White or contact us for the backdrop dimensions for your custom background. Click here to view all Premium Red Carpet Backdrops. Our newest addition the Red Carpet Photo Booth experience, add a clean, modern, and sometimes 3D appearing backdrop to your event. Color 3D Cubes, one of our many Premium Red Carpet Backdrops. Unlimited photo sessions and prints during allotted time! Personalized event text, logo, and graphics for your prints. Choice of 3 complimentary Classic Curtain Backdrop Colors (Red, Black, or White). If you would like something specialized like a Step & Repeat background, just give us a call. Party-O-Matic Prop Kit. Costuming accessories add to the fun with hats, glasses, boas, masks, seasonal items, signs and more! Our kit is larger than just a box – it takes up an entire table. A friendly and professional attendant. Our Attendants will be on hand to ensure that your guests are fully satisfied. They'll help with props, scrapbooking and get everyone in on the fun. Digital Images on a USB Flash Drive. Red Carpet Premium Backdrop Upgrade ($35) Click here to view Premium Red Carpet Backdrops. You can extend your photo booth's run-time in one hour increments. Two photos printed on site per session! (Great for Print Option #1 or #2 – Possibly one for the guests and one for the host.) If you choose one of our print options that include strips, you will receive four photo strips per photo session. Click here to view Print Options. 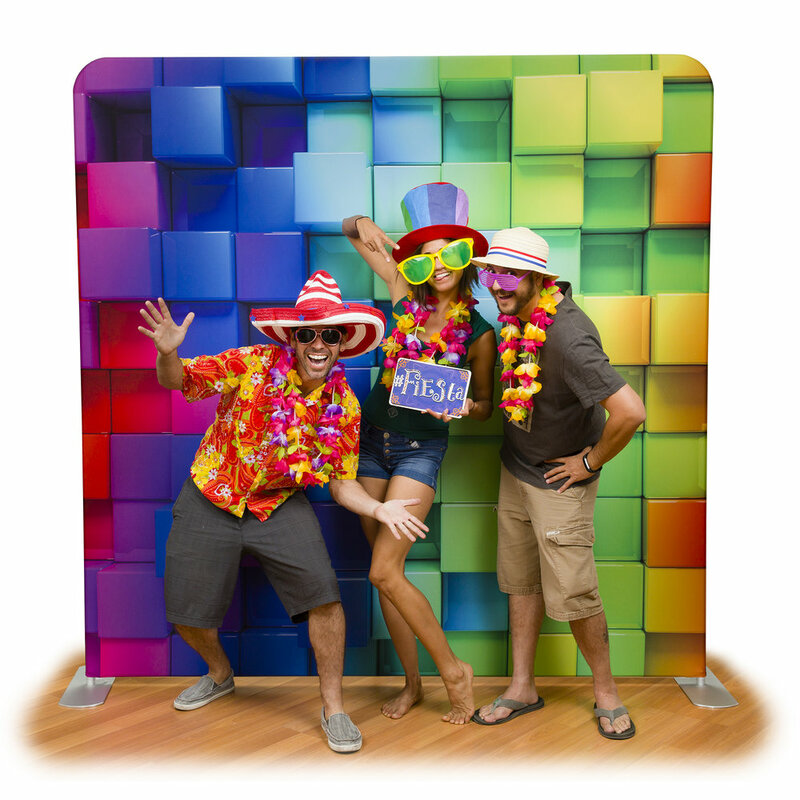 If you choose to add additional time to your photo booth's run time, there is no additional cost for the extra prints. Scrapbook Service ($100) Add a luxurious black scrapbook with black pages created by your closest friends and family to preserve your special event's photos for a lifetime. Includes: a dedicated scrapbook attendant, 12" x 12" w/ 50 sides archival album with black pages and protective sheet covers, metallic colored pens, archival glue, & fun stickers. Save $25 when you combine "2 for 1 Prints" and "Scrapbook Service". Idle Time pertains to hours in which the photo booth is set up, but not operational. For instance, if your event venue states that vendors must be set up by a specified time, but the photo booth run time is to be an hour later, an hour of idle time would be needed. Photo Booth Rental packages are payable by check, cash, PayPal or by credit card. A deposit of $100 is due with the signing of the agreement, with the remainder due the day of the event.